Home News Malaga Corsairs Are About To Hit Their Crowdfunding Goal - You Can Help Too! Malaga Corsairs Are About To Hit Their Crowdfunding Goal - You Can Help Too! Malaga Corsairs are a new football programme in Spain, and coach Rafael Marquez Montes has been working hard to get everything ready to start the season. Team currently has 30 players an 6 coaches. Malaga's vision in the following seasons is to create a steady program in the Andalusian league and start youth and women's selections too, as well as form a football school. They want to create a team that everyone is proud of. Campaign is currently at 8,500eur, where 10,000 is the goal. - The crowdfunding campaign is receiving a massive response from the city. About 300 people have member's club card assigned already. Sponsors are starting to take interest in our project. Restaurants, hairdressing saloons, pubs, stores, etc which have been long in our city want to become a Corsair business and show their support in their businesses. People from all ages is joining this boarding with their Corsairs. We are very happy of the response of our City, our people, to the team. We feel really proud. - says Coach Rafael Marquez Montes. Coach Montes has been around football for quite some time, where currently, besides Málaga Corsairs (Spanish C Division), he is also the OC for Portugal National Team. He was also an asst coach, and later the HC at Zilina Warriors, where the team went from 0-10 to a 12-2 record within only two years, and almost one the championship, unfortunately team lost in the last second. He also served as the HC's Offensive Asst at Slovak National Team, and was awarded with Slovak Coach of the Year in 2013 an 2014. At Barbera Rookies, Coach Montes served as the OC and Consultant, with 10-1 record and promotion to Spanish Div 1. To check the crowd funding campaign, please click HERE. 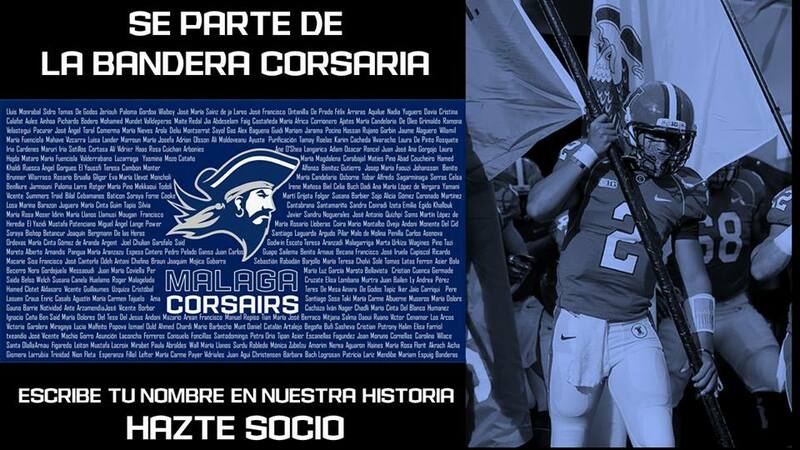 Malaga Corsairs Facebook page - click HERE.